Mobile Check Deposit is a convenient, easy way to deposit checks from your mobile phone into one of your accounts. 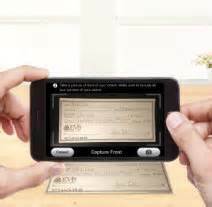 With the Citizens Bank mobile Banking App on your iPhone® or Android®, you can take a photo of your check, enter the check information and securely submit your deposit for processing. It's as easy as 1, 2, 3.
iPhone® (3G or higher) with iOS 4.0 or higher. Older iPhones® and devices without a camera are not supported. The iPad® and iPod Touch® are not supported at this time. Certain restrictions apply and for qualified customers only. Funds may not be immediately available. There may be charges associated with text messaging and data usage on your phone. Check with your wireless phone carrier for more information.